MoM trim back on their ADD tendencies to focus on more rolling, tensile electro-acoustic dub animations in the first of a new series, presented by Infinite Greyscale some 2 years since Jan St. Werner’s Split Animal Sculpture. 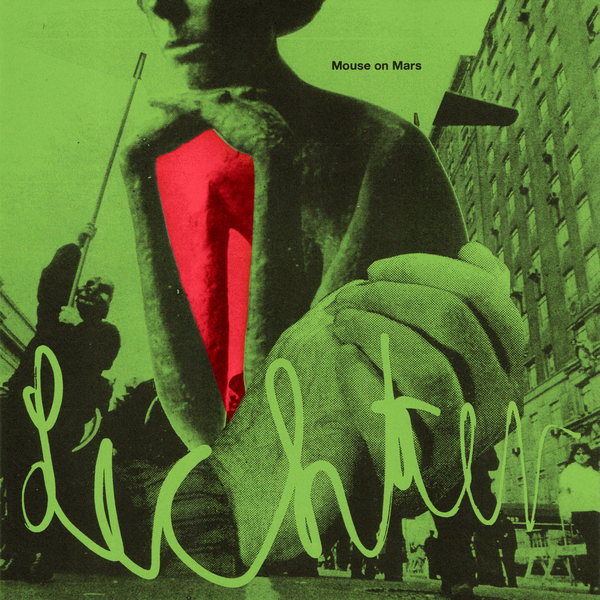 “Lichter is the first piece in a new series of electroacoustic dub compositions by Mouse on Mars. It is a massive, lurching, up-tempo percussive epic – a long-haul runaway train that keeps switching tracks without ever losing sight of its destination. Like much of Mouse on Mars’ output, Lichter deftly traverses a varied sonic landscape, encompassing elements of jazz, dub, krautrock juke and psychedelia. Lichter incorporates trigger robots built by Sonic Robots’ Moritz Simon Geist and features Andi Toma & Jan St. Werner’s long time collaborator Dodo NKishi on percussion. The basic layers were produced with a feedback software called smrph, and were edited, arranged and used as a foundation for various live and studio improvisations. The 13min track, Lichter, is a concentration of these various layers. Lichter is also a highly visual piece, and performed live it employs a bespoke network of light-bulbs triggered by data derived from the sounds and pulses of the composition. Hand-numbered, 1-sided pink vinyl 10" with printed B-side. Includes inserts and download code. Limited to 300 copies.